1 Adam Palmer 7:13	 M 29 Beau's Lugtread Lager 3 seconds off the mens' all time record! A 2 year hiatus from the beer mile certainly hasn't seemed to hurt! 2 Justin Willis 7:55	 M 23 Molson Canadian After bursting onto the Beer Mile scene in 2017, he comes back and smashes his winning time by more than a minute, yet still finishes second. Nothing but good beer mile things to come for this young man. 3 Gavin Hall 8:12	 M 36 Coors Banquet Took last year off but comes back strong! Experts see him breaking into the 7's next year. 4 Jason Wocks 8:23	 M 37 Coors Banquet Senior man in the extended weekend competition, but puts V18 & Palmer on notice. 5 Adam Dziemianko 8:25	 M 30 Coors Banquet A huge PB in only his second (known) beer mile. Sense the hardware could be in Adam's future. 6 Alex Jurkovic 8:43	 M 28 Budweiser Sick of his brother getting all of the attention with the new baby and goes out and posts a new PB with the new bod. 7 Cole Czuchnicki 9:01	 M 30 Coors Banquet First-time beer miler learned all about the chunder, but still came in under 10 mins! Expect big things in beer mile years to come! 8 Austin Horn 9:06	 M 28 Coors Banquet Makes a loud statement in his first Dundas Beer Mile. Could bode well for the rest of his weekend. 9 Ben Jurkovic 9:23	 M 31 Amsterdam Blonde Answers last year's chunder with a PB. Makes a statement! 11 Jessica Willis 9:59	 F 21 Molson Canadian A win in her Dundas Beer Mile debut, setting a ladies' record in the process. AND she keeps a trophy in the Willis household. 12 Ken Kenna 10:13	 M 55 Mill St Organic Top-shelf costume AGAIN, AND he runs a searing fast time; this guy has it all! 13 Lorraine Gavloski 10:39	 F 44 Amsterdam Blonde Slave to the Ron Lariviere Training Program pays off in spades! Second female to beat the standing record and shaves almost 7 mins off her '16 time! Expect single digit results next year. 14 Trent Irwin 10:42	 M 34 Molson Canadian Wasn't even planning on running, yet a boisterous 'pre' gathering urged him to take part and post a PB in his sophomore beer mile! 15 Pete Spring 11:05	 M 22 Amsterdam Blonde Future looks bright for this first-time beer miler. Kicking his dad's arse was an added bonus. 16 Dave Dunn 11:12	 M 45 Stella Artois Spectacular Beer Mile debut! An athlete to keep an eye on next year. 17 Steve Smith 13:45	 M 56 Amsterdam Blonde Big bounce-back from last year's dissapointing result. New beer, new short selection, new result and a beer mile PB. 18 Scott Brady 13:53	 M 25 Coors Banquet Although another respectable first-timer result, sense 'Spyder' was holding something back for the rest of his weekend comps. 19 Rich Gelder 14:11	 M 48 Molson Ex Even with his new MC responsibilities, came through with an impressive result. His Fireball exploits are also starting to grow into things of legend. 20 Jerry Liu 14:15	 M 29 Steam Whistle Lived up to his nickname and showed up seconds before the gun went off. Then drafted F-Bomb before chinning him at the line! 21 Paul Mitchell 14:16	 M 57 Budweiser The usual steady, impressive performance. Let Smith beat him, but countered with some spectacular F-Bombs directed Smith's way. 22 Steve Spring 14:19	 M 54 Amsterdam Blonde Rumours starting to circulate that this first-timer held back so his boss would beat him. Sanctions could be in order. 23 Karel Svobodo 14:36	 M 39 Coors Banquet Another one of the Lower City Runners who made their Beer Mile debut in Dundas this year. So glad they chose us for the maiden voyage! 24 Bonnie Doan 15:13	 F 35 Amsterdam Blonde A year off from Beer Mile racing pays huge dividends! Shaves 8+ mins off of her '15 results! 25 Paula Trainor 15:15	 F 39 Coors Banquet Great debut beer mile time; maybe Sweet Potatoes are the nutritional training answer!? 26 Sam Frisna 15:22	 M 21 Coors Banquet Has set the bar high for his posse in his debut beer mile! 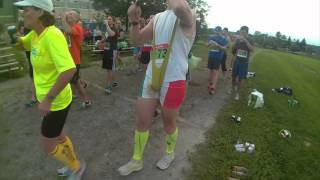 28 John M Campbell 15:28	 M 55 Amsterdam Blonde Trading the sumo suit for a cape and moustache helped shave 2 mins off last year's result..
29 Alison Foster 15:53	 F 33 Kokanee Sense there will be a Lower City Runner beer mile grudge-match next year. Another great debut! 30 Ron Lariviere 16:40	 M 67 Flying Monkey Hoptical Illusion Wasn't feeling it this year, emotionally or physically, so said, 'F-it!' and went with a big-hop beer! Props for the hops! 31 Danielle Irwin 17:28	 F 35 Molson Canadian No sophomore jinx here! Shaves 5+ mins off to set a new PB. 32 Lep Wilcocks 17:28	 M 37 OV Sense the box might see a bump-up in running WODs next spring in anticipation of Beer Mile VI. 33 Jasmina Kucic 18:27	 F 21 Coors Banquet Another great result in a rookie beer mile race. Impressive breaking the 20 min mark in her debut. 34 Surafel Akalu 19:00	 M 23 Coors Banquet HUGE improvement in his sophomore race! Put Bryan Do to shame! 35 Tanner Morrow 19:07	 M 19 Molson Canadian Sense he kept Shane in sight most of the race then blasted past on lap 4. 37 Barry Costello 21:40	 M 64 Molson Canadian Unbelievable maiden Beer Mile voyage for Barry! Could teach the young ones a Beer Mile thing or two! 38 Nick Whitford 23:04	 M 25 Molson Canadian Although a first-time beer miler, his lifting coach had greater expectations. May have to spend more time in the front room rather than the back. 39 Heather McCann 23:47	 F 34 Molson Canadian Yet another great beer mile debut result. Team CrossFit welcomes Heather onto the team anytime she wishes! 40 Meghan Smith 25:20	 F 21 Coors Banquet Nice first Beer Mile; Barrington Av practice pays off! 41 Emily Campbell 26:12	 F 21 Coors Banquet Bounce-back year after failing to finish in '16. 3rd year at Western paying off already. Classic CrossFit move, and a first for this event; ran the race in her 20 lb weight-vest! 42 Leigh-Anne Polkinghorne 26:36	 F 45 Steamwhistle Fought through her dislike of beer and gutted it out., bettering last year by almost 10 mins! 43 Angel Rixtun 32:07	 M 26 Heineken Chundered in his debut last year, schooled the rookies this year shaving almost 8 mins off his '16 result. 44 Bryan Do 32:27	 M 22 Molson Canadian Almost double last year's time? Didn't think the costume and carrying a football would have that big of an impact!? 45 Elizabeth Dowling 37:08	 F 40 Steamwhistle Always setting the bar high when it comes to beer mile costumes...setting the heel high to boot! 48 Alanna Wood DNF	 F 32 Budweiser A wrong race beer selection cost her a finish this year; expect a big bounce-back in 2018! After torrential rain most of the day, the sun came out and the weather cleared for the HDRC Dundas Beer Mile V; The Quint-Essential Mile!